How has this winter been treating you? Personally, I have been very pleased that this has been a mild winter as far as Chicago winters normally go. I mean, the past two winters we have had several days below -20. Those were cold winters. But this winter really hasn’t been too bad. In fact, the past two days we have had sunshine and melting snow. It has me dreaming of beaches and warm breezes! 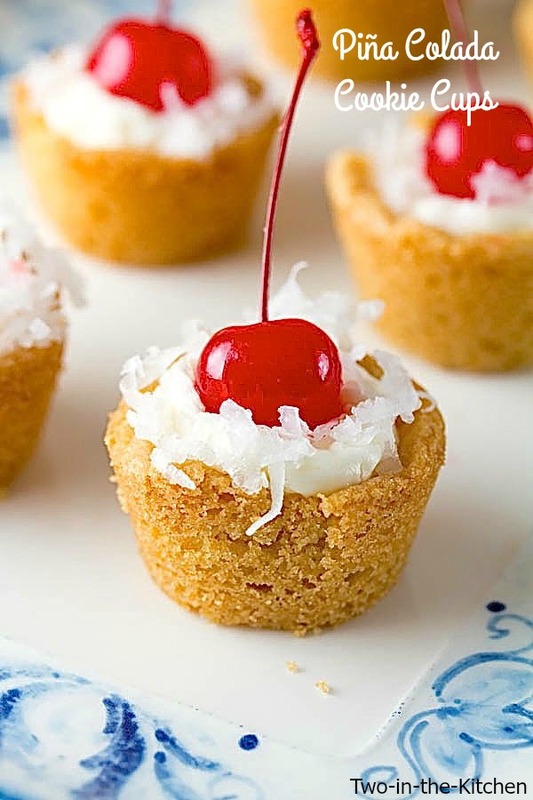 Maybe that is why I got inspired to make these Piña Colada Cookie Cups. I so wish I was on a beach right now sipping a Piña Colada. 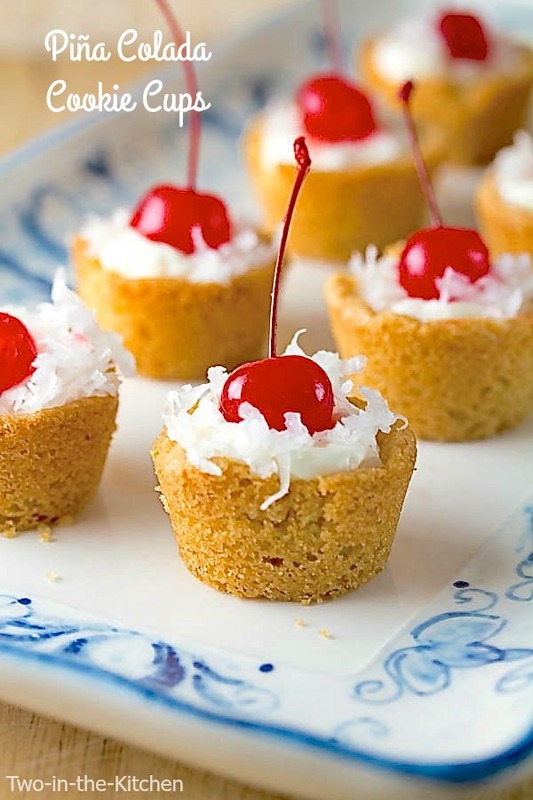 But since I’m not, these Piña Colada Cookie Cups are the next best thing. 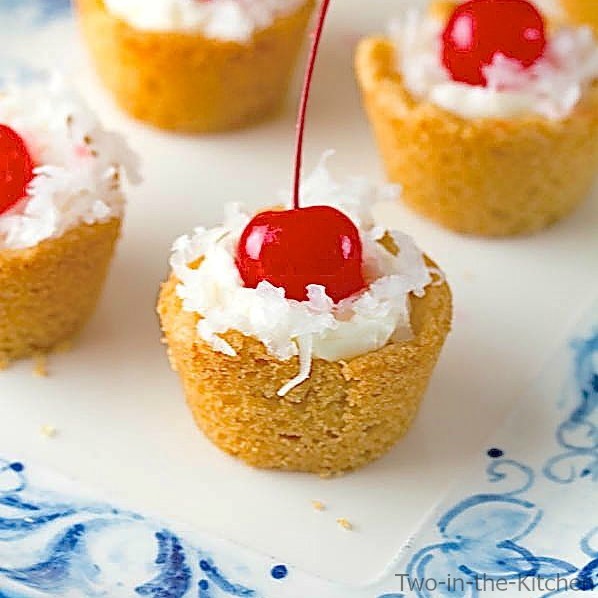 I think the shredded coconut and the pretty maraschino cherries provide just the right touch to make the tropics come alive in this tasty treat. Preheat the oven to 350 degrees and grease a 24 count mini muffin tin. divide the cookie dough into 24 equal pieces and roll each piece in a ball and place in the mini muffin tin. Bake for approximately 11-13 minutes. When they are finished, use the rounded portion of a melon baller or the end of a wooden spoon and press indentations into the cookies. Remove the cookies to a cooling rack to fully cool before filling them. Make the filling by creaming the cream cheese and butter together in a medium mixing bowl. Add the confectioner's sugar one cup at a time. 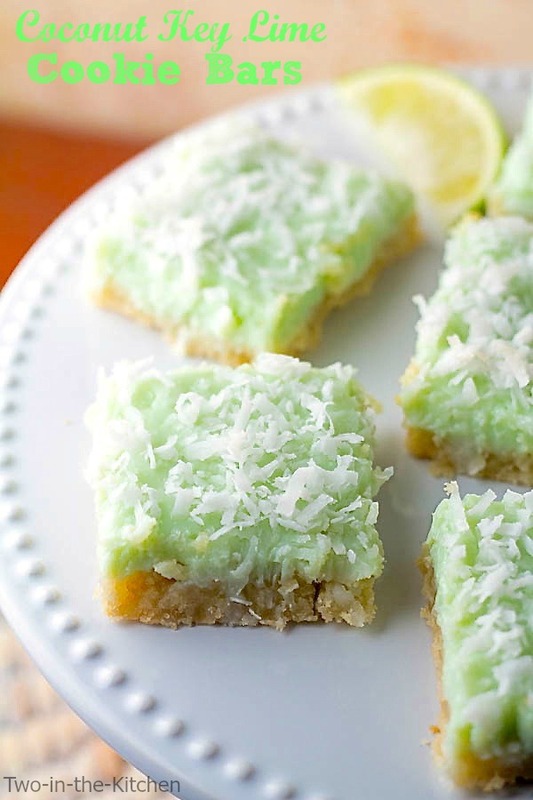 Mix in the rum and coconut. 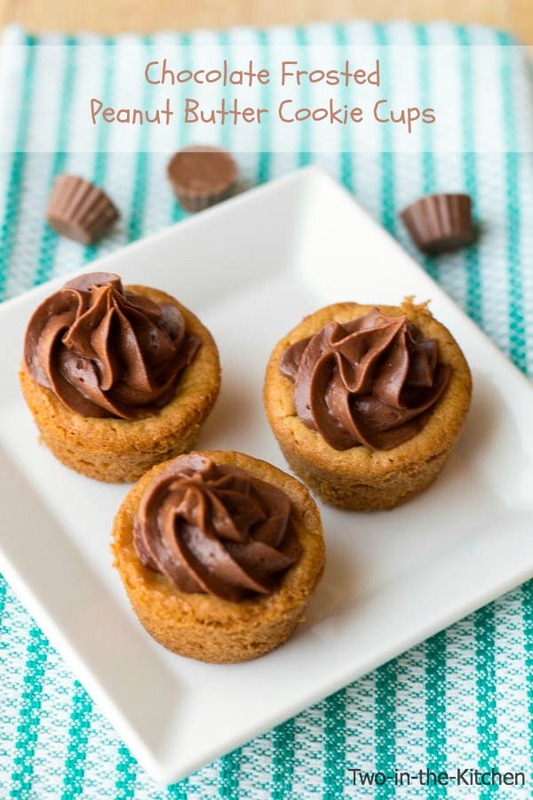 Using a spoon or pastry bag, fill each cookie cup with filling. Top each cookie off with some coconut and a maraschino cherry. I just want to relax with one of these and pretend it’s summer. They look amazing. I’m pretending it’s summer right now too Dannii. “pretending” being the key word!! 😉 Thanks girl. I’ve been loving this mild winter but I’m still looking forward to spring as hopefully the colds we keep passing around QUIT! Love these little treats that bring a little bit of spring to my life! Now I so wish I was on the beach sippin’ on a Pina Colada…but until then – these sweet looking and delicious cookie cups will definitely do! So creative!! The winter by us hasn’t been too bad either … but I still wouldn’t mind a tropical vacation!! 🙂 haha But I’ll settle for one of these cookie cups – so fun! These are really so cute and just what we need to get us into the summer vibe.